The interwebs are alight with discussions about Facebook’s new location-based checkin service Places. Among the flurry of info and debate about its value, one thing may have been overlooked: The secret ingredient of the system that may end up making Facebook a lot of money. 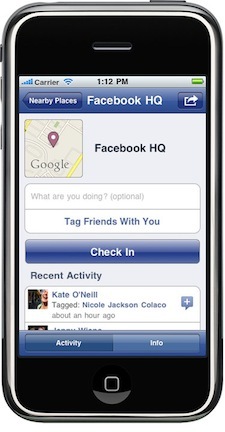 The interwebs are alight with discussions about Facebook‘s new location-based checkin service Places. Among the flurry of info and debate about its value, one thing may have been overlooked: The secret ingredient of the system that may end up making Facebook a lot of money. Because as well as trying to attract users, Facebook’s also trying to attract local businesses to build Facebook Place pages, and associate their Facebook presence with a location. For now it’s a slightly complicated affair to get location data into your Page if you’re a business–involving creating a new Places page, and then associating the two together. It even looks like not every business page owner can do this final piece of the puzzle yet, and Facebook seems to be alerting specific people about the system. Quite apart from this foible, the Places feature is pretty powerful, and notionally works much like business-owned pages in Yelp. Essentially you build a PR page, and then try to attract fans who’ll then checkin when they arrive at the site. Fans get to “play” the location game, businesses get to work out who their clients are–for promotional purposes or even (if they can get hold of demographic data) for business planning or targeted marketing reasons. But Facebook is the engine behind all this, don’t forget–the worlds largest social network, with data on over 500 million users. Stripping the concept of Facebook to its core, one realizes that Facebook’s biggest bankable “value” is the structure of this network (with IDs for each user) and the web of links between friends–everything else about Facebook rests on this core. But with Places, not only does Facebook get to add a potentially money-spinning stream of data to all Places players (namely, your location and location habits, which is data ripe for mining for marketing), but it also gets a new network–the location database of local businesses. Facebook had data in businesses before, but the fact that it’ll now be able to geolocate them means Facebook will likely build up plans for location-sensitive advertising, tied to which particular shop you’re in (imaging a competitors ad popping up when youre checked in, offering lower prices or a promotional discount). It lets Facebook potentially build up a powerful “points of interest” database, should it every feel like leaping into the personal navigation or augmented reality games. It lets Facebook’s app developers come up with creative uses for the data that we haven’t even thought about yet. Similar databases to these exist inside Foursquare, Gowalla, Yelp and augmented reality services Iike Layar. But they have to be populated by each of these system’s users, and as a result they may never become a complete or even widespread and accurate representation of the local business offerings of a particular city or town. Meanwhile Facebook is huge. Its very bulk creates a compelling reason to add your info to its places system. If Facebook plays this game carefully enough, it could swiftly steal big chunks of the business of Yelp, Layar, and many other location-based system (or just buy them later). All it would take is some clever programming, and a revamp of Facebook’s horribly flat and uninspiring UI to make the different aspects of the location games clearly delineated and more marketing-friendly.